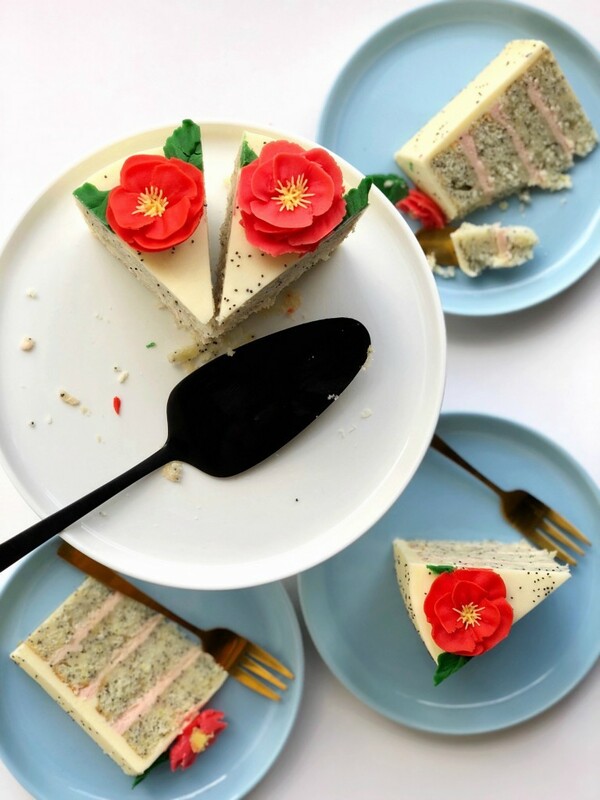 Pretty poppy piped flowers, and a fabulous cake recipe thrown in! “Finally” they all cry in unison! “She actually still knows how to pipe a flower” hooray!! Seriously though, it really is about time I got back to where it all began, and shared a new flower cake design. I said that coming back to the blog, and YouTube and all the social media that goes along with it, that I wanted to shake things up a little. 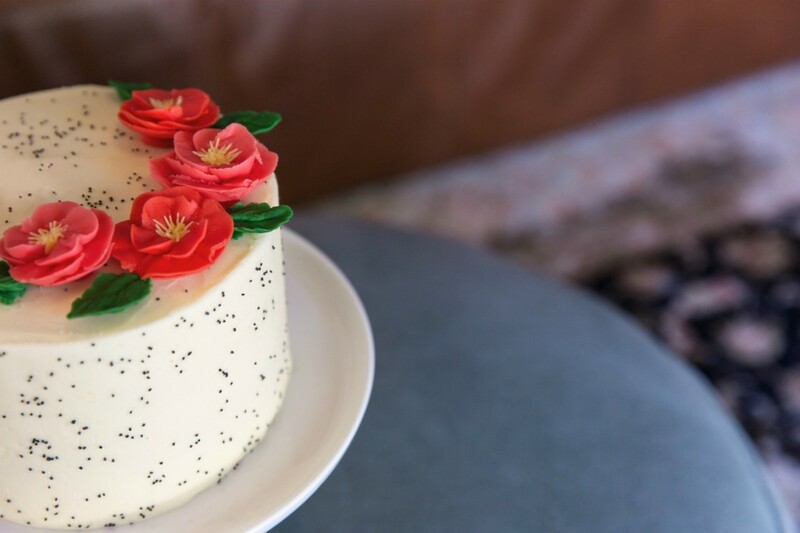 I love piping flowers, but I also love designing recipes, and working on flavour combinations. In what seems like a lifetime ago, I actually wrote articles in bridal magazines as the “flavours expert”. Not sure that I ever really lived up to that title, but I do love to bake, and come up with recipes that people love to eat. If I’m being honest, buttercream piping is my favourite thing to do. Yes it kills my hand, and yes I may have RSI to deal with, but just look at the amazing things you can create. Also, being that I want a cake that tastes incredible too, buttercream really is delicious. This cake has both raspberry and lemon buttercream, so it’s doubly good! 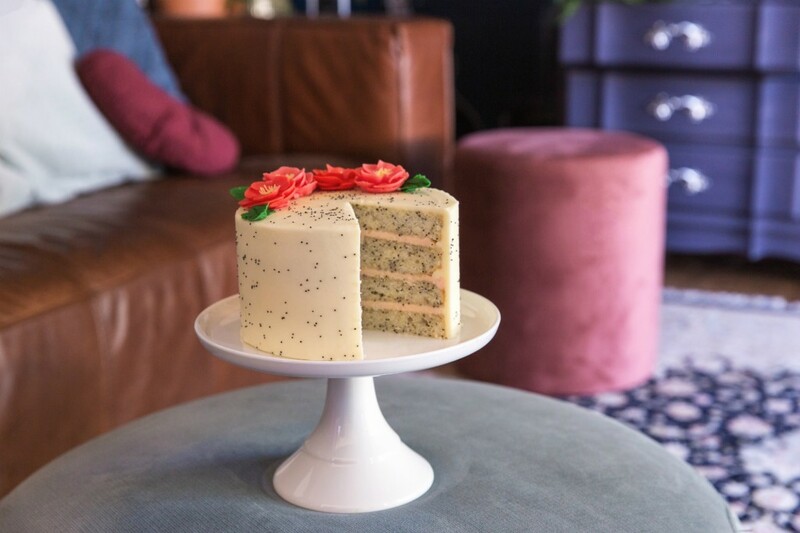 Poppies are a new one for me, however this cake flavour is one that has been a staple for us for more than a decade. In the early 2000’s poppyseeds were everywhere. Oh, and biscotti, how we loved our biscotti! 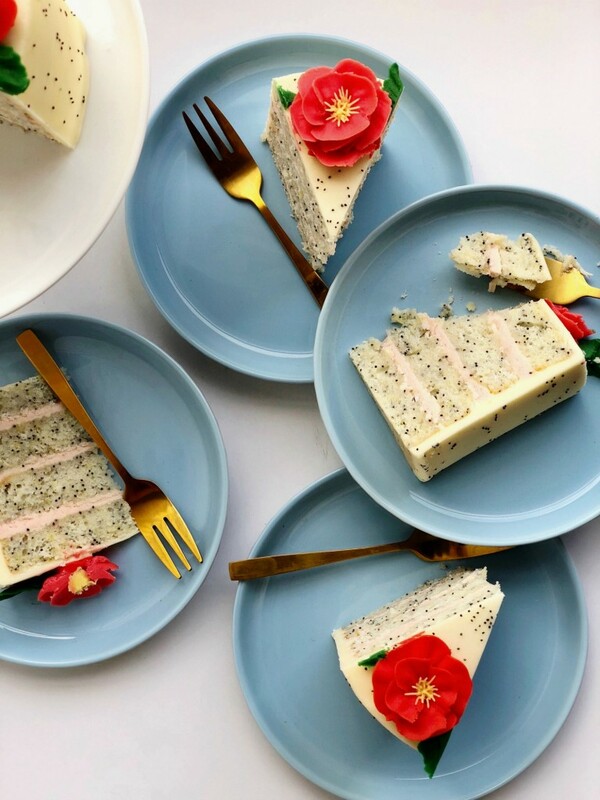 The poppyseeds give the cake a nutty flavour, and a wonderful texture. It actually makes the whole thing less sweet, which is oddly nice I think. I added in raspberry, but this time I didn’t reduce them down, as I didn’t want the cake to taste like raspberry. It’s a flavour that very easily takes over, and I didn’t want this cake to be all ’bout those berries! You could always add raspberry sauce or compote, it’s really a personal thing. We were so thankful to have our close friends Renee and Liana come by and see our new house, and share this cake with us. We have been doing so much painting, demo, building patios and more yard work that 6 trailer loads. It’s been exhausting, but so immensely rewarding. We haven’t owned our own home in over 9 years, and it feels so satisfying to be totally and utterly wiped out from doing so much! So this visit was such a nice way to reflect on all that we have managed to cram into 3 short months. And truth be told, it’s also nice to have a reason to make a cake. 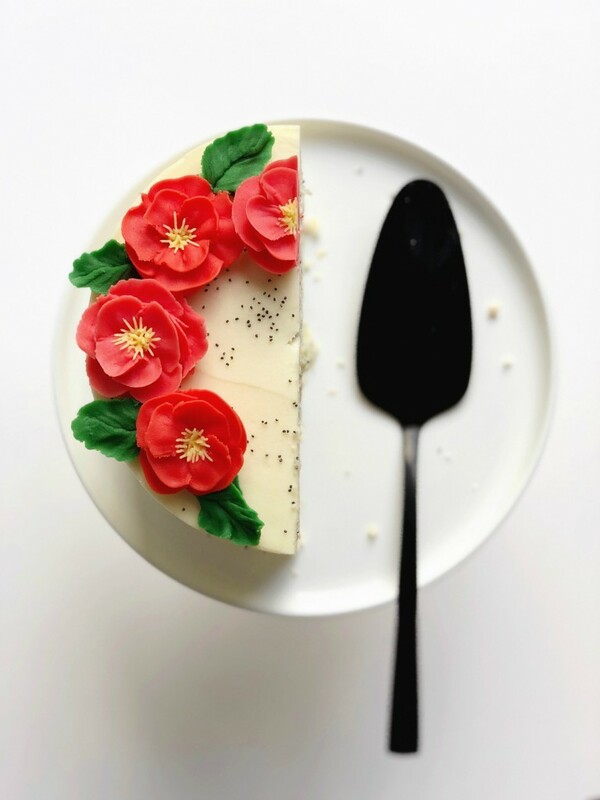 So many times we eat half the cake, and have to freeze the rest or risk it going to waste. Using a mixer, whisk together oil and sugar on medium to combine. Add the flour mix and milk in 3 stages. Scrape down the bowl. Add lemon essence and zest. Add 1/3 of the eggs and whisk until combined. Add poppyseeds. Add the remaining eggs and fold gently. Bake for 30-35 minutes. Remove from oven, and allow to cool on a wire rack. Using a strainer and a medium bowl, press the raspberries through the strainer, so that you only end up with the juice. Discard seeds. Add the raspberry to 1/3 of the buttercream. This will be the cake filling. Add lemon essence to the remaining buttercream.